2012 - Steeped in Luck and Tom Dvorak named to Dressage Canada High Performance Long List for Training based on 2011 performance. "Equine Canada / Dressage Canada High Performance Committee uses the Dressage Canada High Performance Long Lists for Training (Dressage Lists for Training) to determine which horse/rider combinations are most qualified to receive financial and other support from Equine Canada that aids in their development to represent Canada in International High Performance dressage competitions." February 2010 - A Champion Again! Steeped in Luck travelled with trainer Tom Dvorak to Wellington, Florida in mid January. 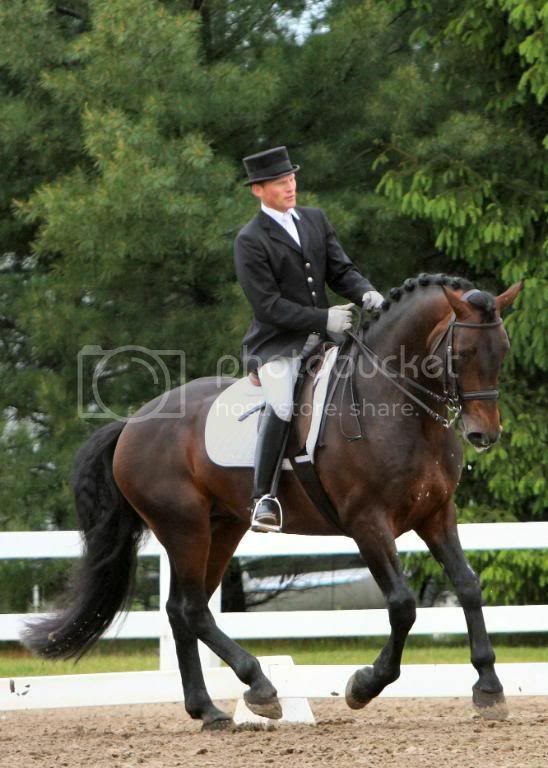 Their first show was the Gold Coast Dressage Opener the last weekend in January where they competed at Fourth Level. Tom and Steeped in Luck were only able to compete two of the three days. Steeped in Luck was 4th on day one and 2nd on day two. Emily, Eamon's right hand lady in Wellington, was very concerned at this show when the FEI vet asked her to lead the stallion from his stall after taking his temperature. Emily thought she had missed some sign of disease and the vet wanted a closer look at the sick horse. Emily was asked to stand the stallion up (pretty-like); at this point, the vet whipped out his i-Phone to take pictures of the unlikely dressage horse to share with his friends. Emily was able to chuckle knowing nothinng serious was wrong with her charge. The best news was that Steeped in Luck and Tom's consistency paid off over the three days - they were Fourth Level Champions!!! Steeped in Luck received a championship ribbon and Tom received a pat on the back; while stallion owner, Keith Douglas received a black jacket with the logo "Wellington Classic Dressage Spring Challenge". Keith keeps a watchful eye on the jacket that he says cost him "$$,$$$". Video available on Steeped in Luck video page. 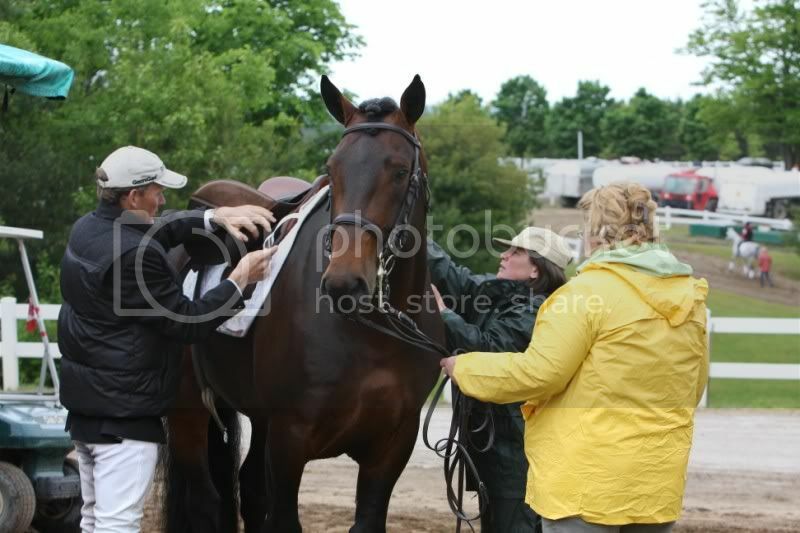 September 2009 - Steeped in Luck is Ontario's Third Level Dressage Champion in Open Competition! After qualifying for the Ontario Dressage Championships, Steeped in Luck and Tom Dvorak have done it again - they won the championship; however, this year it was at the Third Level. Last year, Steeped in Luck and Tom Dvorak were Second Level Champions. These championships are classified as Equine Canada Gold shows. Congratulations and a big thanks go to Team Dvorak! Steeped in Luck was introduced to some new competition when he travelled out of province to compete in Quebec. He and Tom did a fine job with little preparation time after an injury held Steeped in Luck back for a few weeks. Steeped in Luck and Tom managed to be the RESERVE CHAMPIONS at Third Level!!! July 2009 - Steeped in Luck made a brief appearance at 4th level but unfortunately had to be scratched due to a back/pelvic problem (subluxation); he was to continue the summer at 4th level; however, there just wasn't enough time to get him back up to speed. Steeped in Luck was ridden just a couple of times in the first week of August before he headed off to compete in Quebec at Third Level (reserve champion)..
June 2009 Third Level Reserve Champion at what could be Canada's largest dressage show EVER! From the Equine Management Group's website "Palgrave, ON – It was a successful weekend for Cornerstone’s Spring In To Dressage at the Caledon Equestrian Park. With more than three hundred horses competing and over a thousand dressage tests performed over the weekend, it was said to be one of, if not the biggest dressage show ever held in Canada." Steeped in Luck began his second season showing at the national level facing his toughest competition to date. He showed in the OPEN division at Third level for the first time. Class sizes ranged from 17 to 19 horses. Combined scores over the 3 days resulted in Steeped in Luck being awarded Reserve Champion at Third Level. After completing his 3rd and final test, FEI "I" judge Jane Weatherwax's curiosity got the best of her - she had to ask Tom what breed the stallion was while commenting that his mount had the most BEAUTIFUL MIND! Ms. Weatherwax, who judged the most recent Pan American games, gave Steeped in Luck a 70% in one of his 3 tests over the weekend. Thanks to Tom and Ellen Dvorak and the rest of the gang at "Camp Dvorak" for making this happen! Also thanks to Cornerstone Farms for a wonderfully organized successful event. oh ;-) and the ribbon and the silver platter of course! Well, the end of season retirement post below was a little premature. 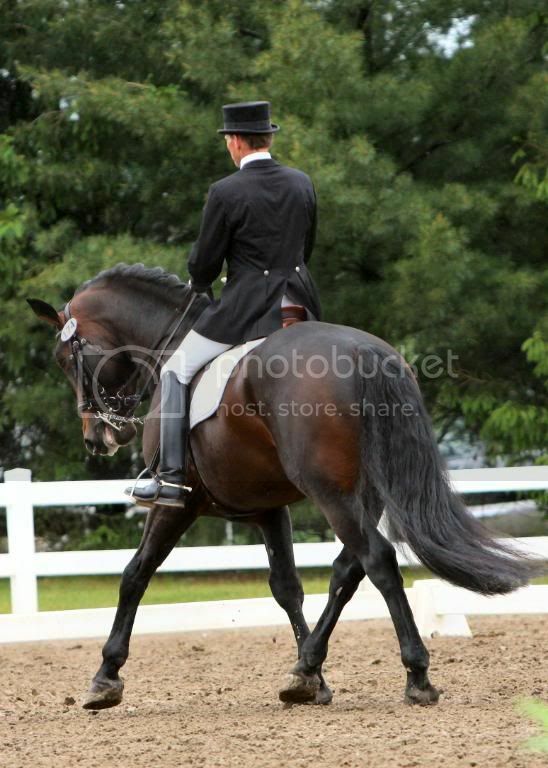 Steeped in Luck qualified and entered the Ontario Provincial Dressage Championships on September 14th and 15th. Steeped in Luck competed against 8 other riders in the Open division and was awarded the Ontario Provincial Second Level Championship. Steeped in Luck's combined dressage scores over the two days were the highest of all 19 horses competing in this division. A wonderful way to end the season. Pairadox Farm would like to acknowledge "Camp Dvorak" for their significant role in this accomplishment. Photo below taken at the Championships. Steeped in Luck is Second Level Dressage Champion in open competition at this highly competitive venue. Four classes entered with three 1st placings and one 2nd placing. With this tremendous performance, Steeped in Luck will concentrate on training at third level and return to the show ring next year. We are pleased to announce the arrival of Pairadox Blue Lady by the late stallion Loguestown Bluesman out of our Atwood Black Laughton mare - Nelly (Ducal State Emblem). This filly is a short coupled stocky filly of traditional type and of rare bloodlines. Keith would like to retain the filly unless "someone shows up with a wheel barrel full of cash". Looks like she will be staying. Steeped in Luck receives his first 70% in dressage. 5 classes with placing from 2nd, 3rd, 4th. Overall 3rd place out of field of 10. Steeped in Luck was tied for first place in one of his classes but the tie went to the other first place contendor. The competition was tougher at this show but Steeped in Luck remained consistent throughout the 3 days of showing. 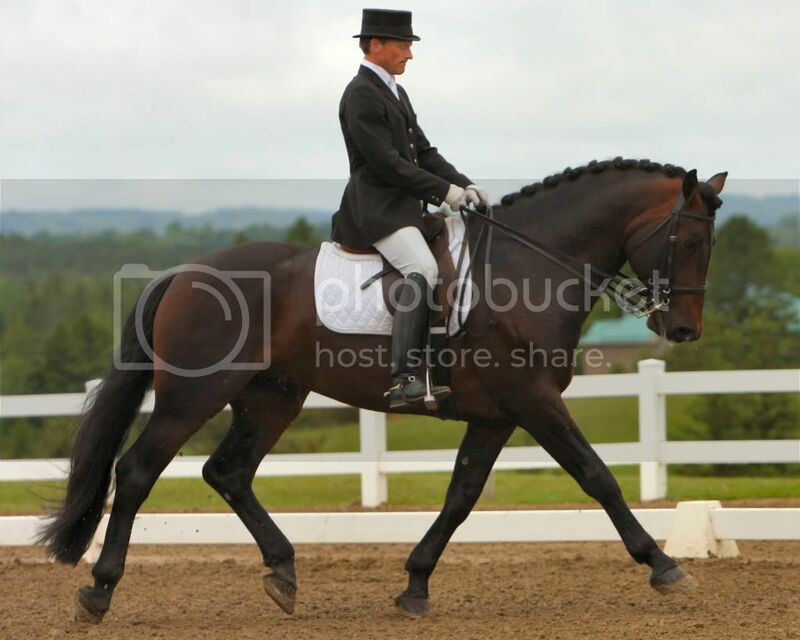 Steeped in Luck RID began his formal dressage show career this past weekend at an Equine Canada Gold (National) Level horse show with renowned dressage rider Tom Dvorak aboard. One of the primary goals for this six year old stallion's 2008 show year was to obtain his Canadian Sport Horse Stallion Bronze Premium status. The criteria for Bronze Premium status in dressage are: five placings over 65% at Second Level from an Equine Canada/USEF recognized dressage show. The scores must be obtained from at least 3 different judges. At this past weekend's KLDA Spring Fling judges Stephen Clarke (FEI O – Great Britain), Lorraine MacDonald (FEI I – Canada) and Brenda Minor (FEI C – Canada) provided Steeped in Luck with the following scores: 68.33%, 68.03%, 67.84%, 67.67%, 66.49%. As a result, Steeped in Luck has completed his requirements for Bronze Premium status in one weekend! In addition, Steeped in Luck and Tom placed 1st across the board (5 tests) and were awarded the 2nd Level Championship at this Gold (national) show. Summary comments from the judges included: "Looks very trainable with good attitude and ability…a very Steady-Eddie horse…consistent test…makes it look easy… interesting in a couple of years." We are very pleased with this young Irish Draught's performance this past weekend and would like to thank the Dvorak team - Tom, Ellen, Alex and the stable crew for their professional work and support. A video link to the test with Great Britain's FEI judge Stephen Clarke is below. Eye of the Crowd is Champion in the Hack Division after placing 1st in Hack Division Road, 1st in Hack Division Show, and 1st in Hack Division Pleasure Classes at the South West Trillium Show at Warwick Equestrian Centre, London, Ontario. Eye of the Crowd was ridden by Carole Menhinik. Eye of the Crowd is sold to Barbara Mitchell of Orangeville, Ontario. More great news will follow this great horse! Steeped in Luck and Pairadox Farm welcome 5 offspring to the farm, one of which resulted from our first hands on embryo transfer on the farm. Keith bumped the pippette while suctioning the embryo from the petrie dish at an inopportune time resulting in "Pairadox Noggin"....yep .. he is all Noggin at this point in time. Eye of the Crowd proves himself as both a line horse and performance horse by qualifying and competing at the Royal Agricultural Winter Fair Cup Classes - making him one of the best 3 year olds in all of Canada. Pairadox Flynn was Pairadox Farm's first venture into breeding the Irish Draught. He was sold to Colleen Hofstetter of Pennsylvania. 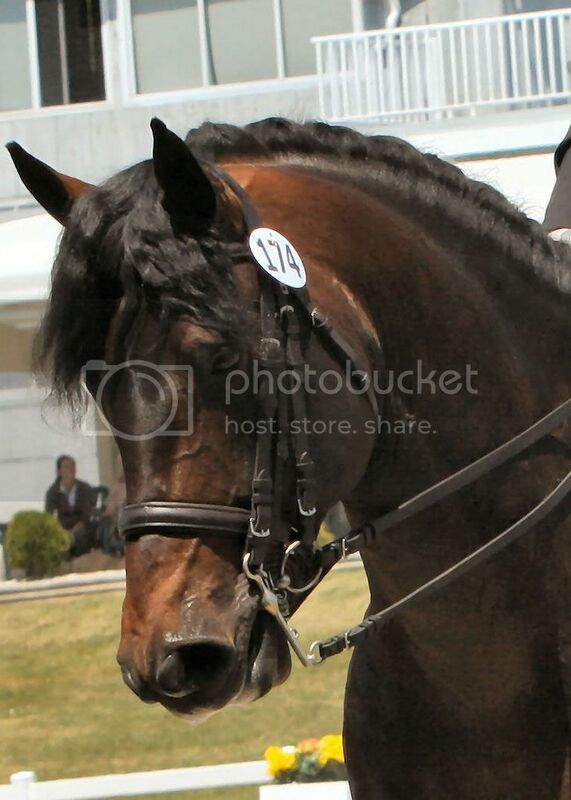 Pairadox Flynn was selected by two time Olympic Gold medal winner Phillip Dutton for Colleen. Colleen had spent several months looking for a horse that would meet Phillip's criteria before she stumbled across the Pairadox Farm website. Pairadox Flynn is now known as "Free and Clear" and was the 2005 United States Eventing Association's 5 year old Young Event Horse Champion (sponsored by Spalding Labs) with Phillip Dutton Aboard. Flynn continues to place in the top with Phillip. Flynn is by Mountain Pearl RID out of Rare One TB.